An indulgent treat for hands. This rich, fast-absorbing cream instantly soothes dryness and leaves skin lightly scented. Boosts skin's ability to retain moisture, so hands look and feel smoother. Conditions cuticles and nails, too. In three delicious scents: Sugared Petals, Berry Blush or original Clinique Happy-the citrus-and-floral fragrance favorite. How to use: Apply to hands as needed. 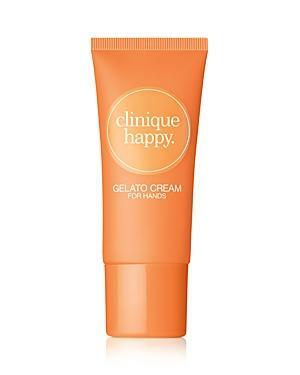 Clinique Happy Gelato Cream For Body - 0.2 Oz. Clinique Happy Gelato Berry Blush Cream For Body/6.7 Oz.